It's natural to want to keep your hamster in your room -- like a nightlight, your furry buddy's presence can bring comfort. If you don't know what to expect, though, or if you don't provide your hamster with the necessary creature comforts, your pet's presence in your room won't just test your patience, it will be downright maddening. If you keep your little guy happy and maintain realistic expectations, though, keeping him in your room with you can be rewarding. Odor is a primary concern when keeping your hamster's habitat in your bedroom, or anywhere for that matter. If you don't clean out the cage regularly, the smells that accumulate will make your bedroom smell unpleasant, not to mention letting cleanup lapse is inhumane for your pet. Scoop out the cage once a day, and dump it all out once a week and clean it with water and a mild detergent before drying thoroughly and applying fresh lining. Make sure the cage is away from direct sunlight and drafts, both of which make smells more potent to you and are health concerns for your pet. Keep your hamster in your bedroom only if you keep it warm in there, as cooler temperatures can send a hamster into hibernation. Temperatures of 65 degrees Fahrenheit to 75 degrees Fahrenheit are appropriate for a hamster. Most of the time, hamsters pretty much take care of themselves -- they don't need as much personal playtime as, say, a puppy. That doesn't mean you can just leave him to his own devices all the time. Hamsters need your attention daily -- actually nightly -- and if you don't give it to him, he'll complain. Since hamsters are nocturnal animals, this means he'll be vying for your attention when you're trying to count sheep. To keep his cage in your room, then, you need to give him attention before bedtime -- take him out of the cage for playtime or hanging out. That way, he won't spend all night chewing on the cage bars and whining for your love. Upon your waking, if your hamster hasn't turned in for the "night," is another good time to play with him. Hamsters love to chew. It isn't their fault -- it's because their teeth grow constantly, and they have to keep them filed down. If you don't give your little buddy something to chew on, like branch, a hard treat or a chew toy designed for hamsters, he's going to grind down his teeth by chewing on the bars of his cage. A metal cage means a clanging noise that is all but guaranteed to keep you up at night. If it's plastic or wood, he'll eventually gnaw through it and escape, which makes any night a little more interesting. Keep him stocked on less-noisy chew toys and one or two chew sticks a week to keep the racket down. Hamsters are nocturnal, and no matter how much attention and how many chew toys you give to yours, he's going to make noise at night. 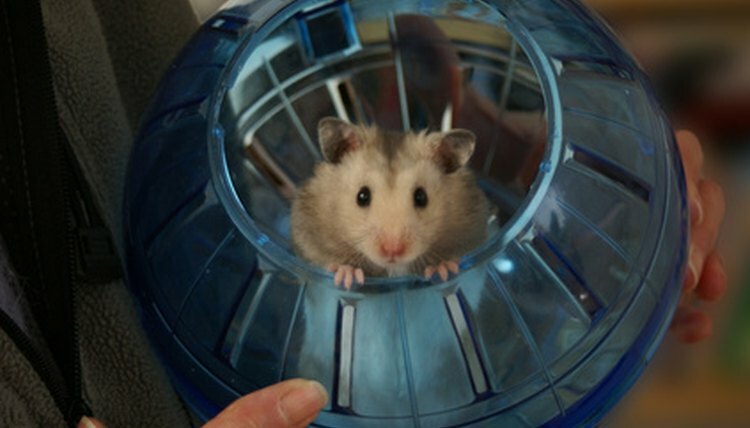 Whether he's scampering and digging in his cage, squeaking or running on his little hamster wheel for exercise, you're going to hear hamster activity after the lights go out. If you're a light sleeper, you may need to rethink your decision to keep the hamster in your room -- you can't force him to convert to sleeping at night. Of course, if you're a deep sleeper, you probably won't even notice the sounds of his nightly routine, so more power to you. Humane Society: Is a Hamster the Right Pet for You?